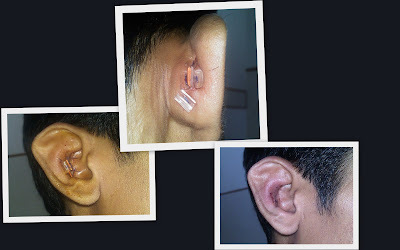 Auricular hematomas are sometimes difficult to manage by the conventional technique of aspiration and pressure bandages. Moreover with bulky bandages it is difficult for the patient to return to work early despite it being a small problem. I have started using a simple way of managing it effectively and with the added advantage that the patient can return to work the next day. Tiny bits of a nasogastric tube, about 3 mm in length are cut to make small splinters, which are then cut in midline to halve them. The hematoma is simply aspirated and these tiny bolsters are secured on medial and lateral aspect of the pinna with convexity to the skin, using a 4-0 prolene mattress suture. The application is done at multiple spots depending upon the dimension of hematoma. These are removed at tenth day with good results and no recurrences.